Cape Town – Round 7 of the RST/Suzuki South/Trac Mac regional motorcycle series began delivering drama as soon as qualifying began, as young gun Brandon Staffen, fresh from a hard-fought third in the previous weekend’s National meeting in Port Elizabeth, went out for qualifying amped up on adrenalin and promptly crashed the AJH Cooling/RPM ZX-6R at Turn 2. He was back on the bike within seconds but as he began his second lap he took a monumental tumble in Turn 1, and was promptly carted off to hospital for a complete check-up. That left David McFadden of RPM Centre to pick up the pieces of the Kawasaki and arrange for somebody to fetch the battered teenager from hospital – with the result that he missed qualifying altogether and had to start both Superbike races from the back of the grid, while Gerrit Visser and the Samurai R1 started from pole – his first ever in the premier class. In the event, for McFadden the outcome was moot; the Stunt SA/RPM Centre ZX-10R had picked up a serious electrical gremlin and was back in the pits after only one lap, while Trevor Westman on the Mad Macs ZX-10R got the best of the start and led for most of the first lap, only to be blitzed by Brandon Haupt on the first of the Fueled Racing R1s in Turn 5. Westman wasn’t about to back off however, and stayed with the defending champion wheel for wheel, while Visser got into a memorable dice for third with Haupt’s bother Bernard on the second Fueled Racing machine, as the top four pulled away from the rest of the field at more than two seconds a lap. Two laps from the flag, Bernard Haupt finally made a pass on Visser that stuck and came home a hard-earned third; fifth was Jean-Baptiste Racoupeau, his best result yet, with international rider Jared Schultz heading the Super600 class on the Uncle Andy GSX-R600 in seventh overall from Gareth Gehlig (Formula Autos ZX-6R) and his father Karl Schultz (ASAP World ZX-6R). 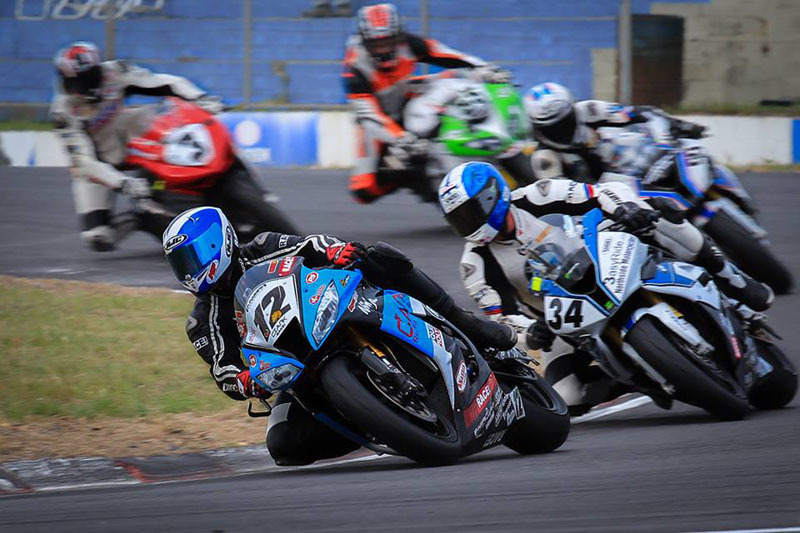 Former champion Malcolm Rapson (Rapson family ZX-6R) made the Supermasters class his own, finishing sixth overall, well ahead of Mark van den Berg (Auto Watch GSX-R1000) and Jacques Ackermann (Mad Macs ZX-10R). McFadden was back for the second race, the big Kawasaki running sweetly again; by the end of lap one he had made up l1 places and was running sixth behind Visser, Bernard and Brandon Haupt, Westman and Rapson. Two laps later he was third and on lap four he grabbed the lead, which was the signal for Brandon Haupt to pull the pin and ignite the dice of the day. For lap after lap he stayed almost within arm’s length of McFadden, several times showing him a wheel and finally passing him on lap eight. Then disaster struck: on his way through the field McFadden’s Kawasaki had been struck by debris thrown up by another rider, puncturing its radiator – but McFadden didn’t know that until it began to overheat and lost power. He shut it down instantly, leaving Haupt to cruise home ahead of his brother and clinch the 2018 Regional title with two races to go, after Westman’s Kawasaki ran a bearing and left him stranded at Turn 5, with Rapson third, way ahead of any of the other Masters. Visser came home a distant fourth after hitting a false neutral going down to Turn 1 and going straight up the escape road, with an elated Racoupeau fifth, and Schultz sixth. Andrew Liebenberg produced a major upset in the Powersport class, romping home on a borrowed Vapourblast ER650, 4.5 seconds ahead of class leaders Chris Williams (Trac Mac ER650), Ezio Miglietta (Kawasaki ER650) and Mike van Rensburg (Simple Maintenance Solutions ER650) to post his first ever win in the class. But it was Class B rider Kewyn Snyman on the Mag Workshop RC390 who really set the a circuit on fire, finishing sixth overall, with no less than three of the faster 650s behind him, setting a new lap record for the class of 1m23.908 along the way. Williams and Liebenberg put up another epic dice in Race 2, finishing in that order just 2.3 seconds apart, while Van Rensburg blitzed Miglietta and Joske Kotze (Suzuki SV650) by less than a second to claim third, and Snyman finished sixth overall again to take Class B honours for the day, well ahead of Connor Hagan (NPH Electrical RC390) and Zante Otto (Otto Racing R3). ‘Danie van Killarney’ Maritz, now well into his fourth decade of motorcycle racing, pulled out his trusty old Pre-Sling, having not ridden in anger since March due to illness, and delivered a master class in racecraft, winning both Clubmans races in fine style. He took the lead in Race 1 on lap 5, holding off on-form Wessel Kruger (Honda VTR1000 SP2), Willem Binedell (Dog Box GSX-R600) and Chris Williams (Trac Mac Panigale) – all of whom finished within two seconds. Binedell crashed out at Turn 1 on the second lap of Race 2, while Kruger led from Maritz and Williams. The rest of that race with a classic, with position changes on every lap – but Maritz was 0.7s ahead, with Williams second, just 0.049s ahead of Kruger.